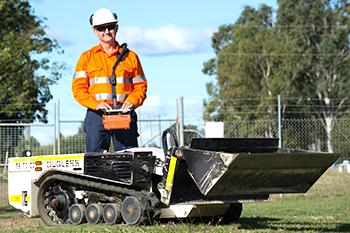 Australian Conveyor & Culvert Cleaning Pty Ltd are a Rockhampton based company providing leading remote controlled mini-loader services for the spreading, levelling and/or removal of material, build-up, spillage or spoil from culverts, overland conveyor systems or confined non-explosive environments. We provide a professional, efficient and effective service to the domestic, construction, local government, major contractors and mining industries. ACCC recognises the need to provide a safe and efficient means of removal of spillage or built up materials from culverts and conveyor systems. The company prides itself on providing a safe and efficient means for the removal of build-up and material from culverts and conveyor systems, through the use of the Dugless 900 remote controlled mini-loader. Duggie, as it affectionately known, stands a mere 560mm high, 1m wide and 2m long and can be remotely driven into culverts and beneath conveyors while the operator controls and monitors progress from a safe distance, it has a variety of applications especially awkward locations. Duggie travels to site in a self-contained trailer, ready to go. ACCC director Allan James received training directly from the supplier of the mini-loader, ensuring expert instruction in its use, maintenance and servicing. Allan has experience working with local & state government, Dept. Transport & Main Roads, major contractors, Aurizon and on numerous mine sites within the Bowen Basin region.